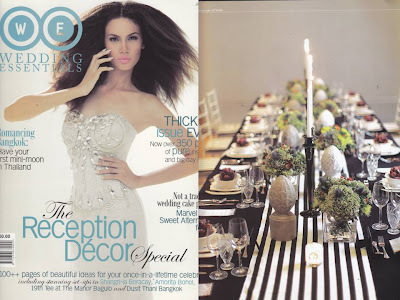 Weddings by Vatel Manila: THANK YOU, WEDDING ESSENTIALS! "One of the signs of a great stylist is his ability to realize the inspiration for his vision. It's one thing to dream up images of a flawless reception, and another thing to execute it to the last detail. Never has this been more accurate in Dylan Gozum's Cavalieri-inspired long table arrangement... Gozum's long tablescape is true beauty personified -- unassuming, straightforward, and ethereal. Set in his vision of a New York penthouse, Gozum puts together items from literature and art, tempering the visuals with floral blooms to exude an intimately elegant wedding vibe." Congrats, honey! You'll soon visit New York for business. Hoola ko iyan sa'yo. Haha.